Another for the annals of excellence without money: I was in a composition teaching workshop last week, half an hour of which was really useful, and the other almost two days, not so much. But it was okay. The last couple of hours was about helping students who are English Language Learners, and study abroad students (that is, students who are studying here, abroad from their country/school). Like lots of schools in the US, NWU is actively recruiting increasing numbers of foreign students. They pay full freight, so lots and lots of schools are recruiting. And they make us look a bit more diverse, though without serving our community's diverse population any better. More and more of these students are coming not for a year, but for our degree (or a joint degree), and that means that unlike the students who visit for a year, these students have to fulfill all our NWU requirements, including composition. So our comp workshop got this talk about how to help these students; all of the suggestions were good ideas, many would help our students in general, especially our first generation students. And, as you'd guess, most of the suggestions involve adding quite a bit of time and energy for the visiting student. And there were no suggestions about what we should give up in order to make the extra time and energy, because "it's for the students. We owe it to our students." Yes, I asked. Indeed, we do owe our students good teaching, help, and so on. But if we add in more students needing special help and more time, then the time has to come from somewhere. I can't make it up out of thin air. Yes, I mentioned that. And I also asked how many international students we could expect in our 20 person comp classes, and was told that the powers that be are trying to spread them so the we all only have 3-4. One. 3-4 students needing additional help, beyond the English as first language speakers who already need additional help, is a lot. Two. 3-4 out of 20 means that 15-20% of our students taking comp are international students. That's a lot, no? Three. We all know this is about demographics and money. There are fewer US students in the traditional age cohort right now. For schools like NWU, that have traditionally pulled from the middle and working class, mostly white, students, and which don't have big reputations, that means some of our traditional students have been getting into and choosing more prestigious schools. Others have made other choices (community colleges, for profits, or just trying to find a job) based on the dismal economics of higher education. And now, all these schools are recruiting international students with great energy. We're mostly getting students from China, Saudi Arabia, and a few other countries which are putting money behind students to give them opportunities to study abroad, often with a narrow choice of majors. And we're following that money. And so is everyone else. The Harvards have always followed that money, of course. And the flagships have also, to a lesser extent. So the top students, the ones most prepared to study in another country are all going to more prestigious schools. The less prepared students are coming to NWU and other schools like ours. And they're bringing money, full out of state tuition, and we're all chasing that money. Truth be told, we're all chasing the money because states don't want to pay for higher ed (or any ed, really), and because our traditional student demographic is on the decline. But that extra money, where's it going? Mostly, it's probably like a finger in the dike. Also, of course, we have to hire a deanling to be deanling of international students. And that person has to have an assistant deanling. And then they need to hire some more adjuncts to teach the English prep classes for students deemed unprepared to enter our comp and other regular university classes. But for those of us who will be doing more work, well, there's no money for that. And no reduction in other responsibilities. My guess is that the visiting students are selected for their talents in areas valued by governments, so tech, business, mostly. The impact on faculty will be high in areas required by the university, so comp, math, especially. These students will have a second language better than most of our first language English speaking students, so they won't impact the languages, except maybe by reducing demand. Business and tech type courses (computer science, maybe physics and such? ), business related courses (communications, public relations) will be in demand. Faculty in, say, art history, probably won't notice a difference. Faculty in comp will notice a huge difference. I'm not sure about math, but I'm guessing some difference. I tend to really like international students, but I'm daunted when I get them in writing courses, and the idea of having 15-20% of the students in my comp course international students, and students whose first language isn't English, is daunting indeed. I feel so slow. Back when I was on our senate, we talked about recruiting more international students, and about special programs, but I guess I assumed they would mostly be visiting for a year, and not working towards a degree from here. I certainly didn't imagine that comp classes would be so deeply impacted. I think we all thought about what a good idea recruiting more international students is, and it is in many ways, without thinking about how some courses would be affected. And now it's coming together, and we're going to really be feeling it. I just finished clicking my grades in (how much more pleasant is that than walking a grade sheet over to the registrar's office by hand)! Tomorrow, I have a refresher on teaching our comp course (because I haven't taught it this year), and then, well, we'll see. 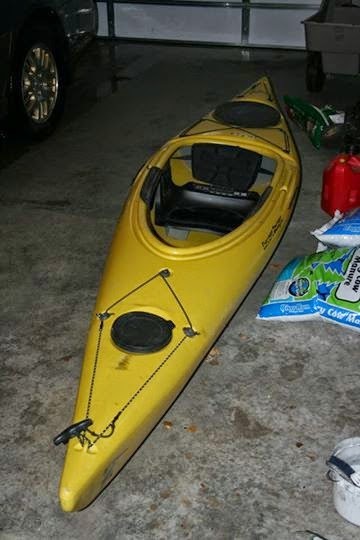 Our rec center was having a used equipment sale yesterday, so I got in line early and bought a used kayak. Now I need to think of a silly or pretentious name. And I need to get some new cord stuff because that's worn, as is the seat. And I need to buy a paddling life jacket and a paddle. Still, the price was right, and I have a boat. Definition: Boat: A hole in the water you pour money into. We Are Respectable Negroes wrote yesterday asking if we're products of Brown v. Board of Education. I suppose it's telling that I started thinking about Brown v. Board this morning when I heard an NPR conversation with a woman (I was half asleep and don't remember her name, sorry) about being a product of Brown v. Board. As a white woman who grew up in the 60s, in Northern California, I wonder in what ways I'm a product of Brown v. Board. When I was starting elementary school, my school was torn down for earthquake issues, and we were bussed to a school in a slightly poorer neighborhood. At the time, I remember one Black family in my neighborhood, on one side of a highway, and one other Black student in my class. In the other school, on the other side of the highway, I don't remember more Black students. By third grade, the school in my neighborhood was built anew, in the latest school fashion, and we were all back there halfway through the school year, including the kids from the poorer neighborhood across the highway. But still, I only remember one more Black student in my class. I do remember about that time that I spent my reading group time "tutoring" a boy from El Salvador in reading. (I feel so bad that I was assigned this task, and that he wasn't taught by someone who knew how to teach. I suspect it had to do with the teacher not having other resources, and our school being unprepared to teach students for whom English is a second language. I hope things turned out okay for him despite me.) I don't remember many Asian students in my grammar school, either. By the time I was in middle school, there were a lot more Asian and Black students; I remember seeing the Korean girls reading their comics in the lunch areas and not understanding. But I was put in a special classroom, and I'm pretty sure just about all of us there were white, and most of us there were from the wealthier side of the highway and tracks. In high school, I was in a much more diverse school, but most of my classes weren't diverse because as a white girl from the wealthier side of the highway and tracks, I was tracked into college prep classes (though not AP classes), while most of the Black and Hispanic kids were tracked into non-college prep. The Asian kids and white kids from the poorer side of the highway and tracks were in both college prep and non-college prep classes, depending, I think, on their parents' advocacy and such. For example, my high school had, I think, three or four Black teachers, two in English, one in athletics, and one, I think, in shop. I remember that one of the Black teachers had to really advocate for her children to be in the college prep track, and if I was aware of it, it must have been a huge deal. So how am I a product of Brown v. Board? I'd guess the biggest thing was that most Black students in my area were tracked into non-college prep courses, and weren't given the same opportunities that more white students had. I wondered as a kid if the bussing I experienced was the same as the busing I vaguely heard about on the news where there was or had been newsworthy conflicts. Was my school torn down and rebuilt as a way to integrate it further? It had that effect somewhat, but mostly because the other school was closed and the grounds sold off for condo development. But I think now that it was really about earthquake issues. I guess the bussing was the one thing I learned at the time about Brown v. Board because it was on the news. So, other USians, how are you a product of Brown v. Board? Last Wednesday, my community had a birding day. The biology department at NWU, working in conjunction with local birders and the community, had set up five areas around town where they stationed experienced birders from 8am to 8pm. They advertised pretty widely, which is how I found out about it. So I went. It was perfect timing for me because I had a final in the early afternoon, but I'd managed to be caught up on grading to be able to give those students back their papers, and I'd have time to grade more before my Friday final. So I started out with a friend before 8am, and got to the first spot, the Prairie Pond, as the birder was setting up. We saw some birds there, and then the birder told us about a place not far away, another pond area, where there were likely to be more shore birds, so we checked out that place, McComb Pond. We saw a number of birds, wrote them down, and then reported back. And then we moved on to the town pond area, which was up a hill a bit, and where we saw several new birds (new to me, anyway). Then I dropped my friend off, so that he could go to work, and went to the third spot, Braun's Bay (water is a major theme of the day). That was the least good place for me of the day. After my final, I walked over to the campus spot, and saw that the two birding folks were from the biology department, so I had a passing acquaintance with them. The main spot was right at some stairs, and then there was a path that went on a ways, and one of the biology people said he wanted to check the path. So I asked if I could tag along, and that's where I really learned some stuff. Mostly, I picked up much better how to see warblers, where to look for them, how to see them. I can't explain better, but he was showing me birds, explaining what to look for, and in that way that real birders have, he could just see them way better. I saw a number of birds for the first time, and most of them I could now identify by sight. Just seeing them, having an explanation, that really seems to stick for me. The big thing for me that day was that the more experienced folks were really helpful in pointing out the birds, and in helping me see how to make the different identifications. I could have walked in those places alone, and I would have seen some birds, but not what I saw with them, and not learning as much as I did. This morning, I woke up early and felt like being up, so I went out to McComb Pond, and I was seeing a whole lot more warblers than I had. It's like I was seeing them, though they'd probably been there when I went before and just saw a couple, but this time, I was way more aware somehow. I have to credit the Wednesday outing, because I was able to identify several of the birds I saw easily, and with a good degree of certainty, too. This is a Chestnut-sided Warbler! So very cute! And a local guy, strutting his stuff at the local park. My commute is far more likely to be held up by this sort of strutting (sometimes in the street, sometimes because I stop to watch when they aren't in the street) than by traffic. I had a final this afternoon in a classroom building with halls full of classes for 20-30 students each. During the semester, the class happened at 1pm, so during the semester, there are a fair number of classes happening at this time. As is my practice, I got to the final a few minutes early and let students start early. Time usually isn't an issue with this exam format, but it helps students feel a little less stressed if they have more time. And then, about five minutes into the exam time, there started to be increasing noise in the hallways. So I went out and asked people to be quieter. A few minutes later, way more noise. Again, I went out. And a few minutes later, more noise yet. And again, I went out. I suggested that the people in the hallways might go elsewhere to chat, and that's when they told me that they had to be THERE because they were told to wait in this hallway for the graduation rehearsal. After that, mostly the people right outside the room were pretty quiet, but there was a lot of loud chatter from down the hall. The last time I went out, I asked people to be quieter, and the person who was being loudest told me that they had to talk because it was for graduation rehearsal; she had some handout thing, and seemed to think she was in charge. And finally, after a half an hour into the two hour exam, things quieted down. In the meanwhile, I contacted my chair, the two people listed as contacts for the graduation rehearsal, and my university senator. Why is grading so onerous? I'm sure everyone else tries to write assignments that will lead to interesting projects and papers, but still, grading is onerous. Grading is so onerous that we make jokes about cleaning houses as procrastination and so on. But I really want to think about why it's so bad. That and I'm procrastinating. Are you? I have about 50 projects to grade, three exams to write, three exams to proctor, 50 exams to grade, and then the semester's done. If I grade about 13 projects each day, and write one exam per day for the first three days, then I should be on track for handing back projects for finals and being read to grade finals after they come in. I had a lovely weekend, involving a picnic, birding, biking, and a native plant sale, but not grading or writing exams. So now the push is on. And my first ever Sora. That was weird, because it's not like I study shorebirds, but I saw it and thought, hey, a Sora, and looked at the book, and that's what it is. So for some reason the image and name stuck in my head from just perusing, I guess. anyway, it was way cool. And continuing my fascination with the Yellow-headed Blackbirds! I thought more about the goals, more about the class, and more about stuff last night, and realized that I hadn't put in some of the stuff I think is really important. 3. I want students to get a sense of the historic, cultural, and social contexts of early modern theater. 4. I want students to begin to learn research (asking questions, finding information, reading critical articles for the argument). One of the problems I have with these sorts of exercises is that over the course of 15 weeks, I want students to learn a lot, and to think hard, and to begin to put things together, but I know different things will stick with different students, and that I can't do everything, but that there are probably 20 things I want to stick with someone in some way. In the ever constant race to update and revise and be prepared for our next departmental review, we're doing these projects to make our courses "outcomes based." For every course, we're supposed to have goals (which, as I understand it, are supposed to have to do with what we want students to learn), outcomes (which, as I understand it, are supposed to have to do with what students produce to show that they've reached the goals), and sub-outcomes (which, as I understand it, is what students actually produce to show they've reached bits and pieces of the bigger goals and outcomes). We're supposed to have between 1 and 4 goals, 1 and 4 outcomes (one for each goal), and for each outcome, 1-3 sub-outcomes. I want to brainstorm a bit here, because I find this sort of stuff intensely frustrating and not fun, and I don't think I find it nearly as helpful as the edu folks keep promising I should. Let's take, say, an intro Shakespeare course, a genre-based Shakespeare course. What should the goals be? 1. I want students to get better at reading difficult texts. Do those goals make sense? Are there better goals? Are there more goals? Edited to add: There should be something about writing in there, maybe in the first one, reading and writing about difficult texts? Last year I saw my first Yellow-headed Blackbird. This year, I saw about four all near by. I also saw bunches of ducks, and a couple of Wilson's Phalaropes! You may need to click on the pictures to see the Phalarope; they're the two smallest birds in each of the last two shots, floating lowish in the water. We just finished an almost 2 hour meeting; we also had a two hour meeting of the same group last week. We finally voted, after many hours of discussion. The frustrating thing is that I don't think a single person changed their mind as a result of the discussion. I need to go outside! It's that time of year when I'm really ready to be done with stupid excuses, both from students and administrators. I'm tired of administrators putting up hoops, and then saying that we have to make our hoops or someone else will make them for us. And I'm tired of fellow faculty deciding to hold the hoops up as high as possible for other faculty so that they can look like proper hoop makers and holders for the administrators. I need a serious break before I participate in even one more meeting about goals, outcomes, rubrics for programs of varying levels, and so on. I was following link bait from effbee earlier today, and read an article about retiring near college campuses to communities with close ties to those colleges, including opportunities to audit classes and so on. The long answer, at least for state schools, is that as state (tax) support for schools has gone down, tuition and fees have gone up. The voters have long voted for politicians who promise lower taxes in all sorts of ways, and keep voting for those politicians. They argue that education is a private good, and we state taxpayers shouldn't pay for it, and so we pay less for it (as taxpayers) and students pay more individually. It's no secret that I don't like any of this. I'd happily pay a lot more in taxes for well-supported schools (at all levels, from pre-school to graduate programs), universal health care, and better social services of all sorts. And I vote that way when I can (though finding any politician to vote for who will promise to raise taxes to support schools seems pretty impossible). So, should seniors get reduced or free tuition or auditing privileges at state schools? What about you folks? What do you think?